Chris Knierim Photos, News, and Videos | Just Jared Jr. There are regular group selfie pics, and then there are Team USA selfie pics and the US Figure Skating Olympic team has one of the best! Ice dancer Alex Shibutani snapped the epic shot of the (almost the) whole team after winning the bronze medal at the team event over the weekend in South Korea at the Olympics — and it was quickly shared by the entire team on social media. Bradie Tennell captioned it, “Squad goals”, and we definitely have to agree. 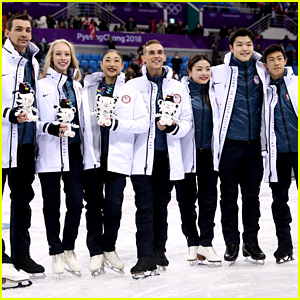 Nathan Chen, Adam Rippon, Mirai Nagasu, pairs skaters Alexa Scimeca Knierim and Chris Knierim, and Alex‘s sis and ice dance partner Maia Shibutani are all featured in the photo. Tonight, the first figure skating event will kick off at the 2018 PyeongChang Winter Olympic Games with the team event. Team USA has chosen Nathan Chen and married pairs skaters Alexa Scimeca Knierim and Chris Knierim to rep them on the ice for the event. So, what exactly is the team event? It’s kind of like the team event in gymnastics at the Summer Olympics. There will be a short program and free skate is held in each of the four disciplines: men’s, women’s, pairs and ice dance. Skaters are judged as usual, but teams are scored based on placements within their discipline. So, if a first-place performance would earn a country 10 points, a second-place performance would earn nine points, and so on. Team USA still has to choose a rep for the ladies and ice dance sections. However, countries are allowed two substitutions, meaning that for two of those three disciplines a different skater or team can be used in the short and free. After each of the short programs, the top five highest-scoring teams advance to the free program round. At the 2014 Sochi Olympics, Team USA earned a bronze medal for the inaugural event. You can watch it TONIGHT, starting @ 8PM on NBC. A congrats is in order for U.S. Figure Skating Champions Alexa Scimeca and Chris Knierim! The 25-year-old and 28-year-old skating pair got married over the weekend in Colorado! Several members of the U.S. team were in attendance, including Ashley Wagner, Madison Chock, and Max Aaron. In case you didn’t know, Alexa and Chris won the silver medal at the 2016 Four Continents, the bronze in the 2014 Four Continents, and the gold in pairs for the 2015 U.S. Figure Skating Championships.